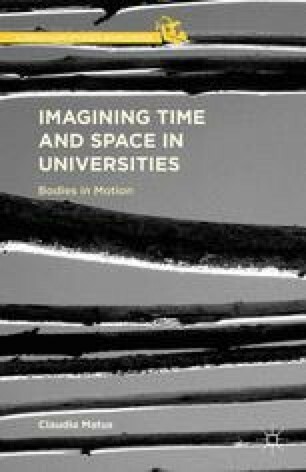 This chapter explores how the construction of “the international dimension” in universities is related to particular nostalgic temporal and spatial imaginations. As I already noted in chapter one, the most common institutional international initiatives are developed, mainly, through the exchange of students and faculty, the internationalization of curriculum, and the export of programs of study (e.g., English as a Second Language). One concern with these policies and practices that seek to develop an international dimension in research universities is that they uncritically imagine “international” space as the congregation of different nationalities, which are not separate from popular prefigured imaginations of countries that suffer from war violence, poverty, disease, and/or posses an “exotic culture,” among other characterizations. These practices of institutional internationalization—viewed as containing attractive, authentic, and contradictory cultures, lives, and essences—reproduce and naturalize a way to imagine and organize global space that reinscribes and reenacts particular ideas of nation, border, region, and more. These imaginaries not only perpetuate the idea of the “world at a glance” (Casey, 1999, p. 80), but also reproduce “natural” relations between people and nation. This way to imagine “international” space uses a form of nostalgia that reproduces a desire to reenact a “real” place (nation/country/culture) in an absolute time.